I have posted interactive grammar and vocabulary exercises based on Korean historical dramas at http://k-drama-english-grammar-and-vocabulary-exercises.bitballoon.com/. The exercises have time limit and automatic scoring. These exercises are primarily designed for Asians who are beginning learners of English. (If you’re already an advanced learner of English, you can also use these exercises to refresh your knowledge.) Thus, the exercises focus on errors in grammar that Chinese, Koreans, Filipinos, Malaysians, Indonesians, etc. commonly make with articles, prepositions, gender pronouns, tenses, and subject-verb agreement, among others. With these exercises, you can foster your love for K-dramas and at the same time learn English grammar and vocabulary. Later on, I will post exercises based on The Flower in Prison, Jumong, Six Flying Dragons, A Tree With Deep Roots, Yi San, Rebel: Thief Who Stole People, The King’s Doctor, and Saimdang, Light’s Diary.. If you have questions. comments, or suggestions for these exercises, you can post them in the comments section below. use on-screen flash cards and quizzes from any high-interest text to further reinforce learning. instantly obtain a Rewordify.com Reading Level Analysis for any passage, for effective differentiation by readiness. Note: I’m writing this spoiler-free synopsis to illustrate what Plain English, Plain Language, or Clear Writing is all about. Among other things, Plain English means writing sentences that are short, simple, clear, and strong. Jump to synopsis of Episode 1; 2; 3; 4; 5; 6; 7; 8; 9; 10; 11; 12; 13; 14; 15; 16; 17; 18; 19; 20; 21; 22; 23; 24; 25; 26; 27; 28; 29; 30; How I made these synopses spoiler-free; Related article (external link): Backgrounders on historical Shin Saimdang and other information. (2) the re-edited version known as the SBS version, with 28 episodes, that was broadcast in Korea; you can read the synopsis for the SBS version in my “Campus Connection” blog. The international version is much better than the SBS version. You can watch the international version’s 30 episodes on iflix (paid subscription basis). Here’s a tip: Register for iflix’s 30-day free trial subscription and then binge watch (marathon) the whole drama within the free trial period. You can read below the differences between the international version and the SBS version. The drama begins centuries ago in an Italian castle where there’s music and dancing during a stormy night. Despite the festivities, Lee Gyeom locks himself up in his room, furiously painting a portrait. Seo Ji-yoon is a businessman’s wife and the mother of a young boy. While pursuing her PhD, she works as an instructor in Hankuk University’s Art Department. She’s given a big career opportunity by Professor Min Jung Hak in presenting her evaluation of “Mount Geumgang”, a centuries-old painting of mountains by An Gyeon, a famous Joseon artist. But the presentation is disrupted by Han Sang-hyun, a young instructor who has previously been in conflict with Prof. Min. In an art conference in Bologna, Italy, Prof. Min tells Ji-yoon to change her major because he will not allow her to get her PhD. Ji-yoon gets locked out of her hotel room, and her problems worsen when she hears from her friend Hye-jung that Prof. Min has told the University that she must be fired from her job. In despair, Ji-yoon wanders around Bologna. In an alley, she nearly gets run over by a bicyclist, and she stumbles over a book stand. The owner apologizes to her by giving her a stack of books. Later, she discovers among the books an ancient diary that mentions the “Mount Geumgang” painting. Prof. Min and the director of the Sun Gallery connive to present “Mount Geumgang” as authentic, thus earning for both of them money, prestige, and power. Ji-yoon’s investigation leads her to the castle known as “Siesta Di Luna” in Tuscany, Italy where the real estate agent shows her the enormous halls filled with all kinds of art works. Ji-yoon and Lee Gyeom’s spirit cross each other, and as if she’s possessed, she rushes to a room where she stares at a painting. The glass cover then breaks into a thousand pieces, and Ji-yoon is stunned to find behind the painting a full-length portrait of a Joseon-era lady. Ji-yoon returns to to Korea with the diary, the seed pouch, and the portrait of a Joseon beauty. Almost immediately, she’s forced to face a disciplinary hearing at the university. In her desire to see An Gyeon’s “Mount Geumgang” painting, the young Saimdang climbs over a fence of a compound owned by a member of the Royal Family. There, she meets Lee Gyeom. Ji-yoon and her husband are involved in a multiple-car collision. At the hospital, Ji-yoon begins having visions of herself as Saimdang returning to her ancestral house. Ji-yoon is terminated as lecturer in the university, while her husband goes into hiding as his company collapses. As Ji-yoon and Hye-jung study the diary, they begin thinking that Prof. Min’s “Mount Geumgang” painting is fake. Ji-yoon asks Han Sang-hyun’s help in translating the diary. Later, her financial problems worsen when debt collectors force their way into her apartment. The young Saimdang spends her time painting at Unpyeongsa (Unpyeong Temple). As she follows the Head Monk around the temple compound, she sees numerous people in pain and suffering. In her vision, Ji-yoon, sees the “Mount Guemgang” painting hidden in a wall in Saimdang’s ancestral house. Later, she finds the Biikjo seal on the portrait of a Joseon beauty. Brought together by their love of painting and poetry, Saimdang and Lee Gyeom fall in love with each other. Saimdang sees a rowdy group of government officials, gisaengs, and private soldiers arriving at the temple compound. Part of the group is Min Chi-hyung who’s a town mayor and a prosperous businessman. Besides widening his political connections, he also wants the Head Monk to supply him with the temple’s famous Goryeo paper. While waiting for Saimdang’s parents to answer his marriage proposal, Lee Gyeom meets again the lowborn girl Seok Soon. Infatuated with Lee Gyeom, Seok Soon doesn’t give him Saimdang’s letter. As Min Chi-hyung and his men start killing the monks and the people at the temple, Saimdang and Seok Soon run for their lives. To save Lee Gyeom, Saimdang agrees to marry someone else. Ji-yoon and Han Sang-hyun travel to Saimdang’s ancestral house “Ojukheon” in Gangneung. Ji-yoon’s husband finds out the connection between his company’s collapse and the activities of the Sunjin Group of companies. Saimdang and her children visit her mother at their ancestral house before leaving for Hanyang (Joseon’s capital). Lee Gyeom creates a scandal during his wedding. Min Chi-hyung is now a high government official and a prosperous paper merchant. His wife Hwieumdang is the former lowborn girl Seok Soon; she’s now an accomplished artist whose paintings are coveted by the wives of government ministers. Ji-yoon and Han Sang-hyun fail to find the “Mount Geumgang” painting in Saimdang’s ancestral house. Lee Gyeom walks out of his wedding and later goes to Hanyang to ask the King to annul his wedding. The King agrees on the condition that Lee Gyeom will serve him in a government position. Lee Won-su, Saimdang’s husband, gets scammed and loses the house in Sujinbang that Saimdang’s mother bought for Saimdang and her family. Saimdang and her children find themselves homeless in Hanyang, and to make matters worse, her youngest son Woo becomes sick with measles. After the feast, Lee Gyeom and Hwieumdang (the former lowborn girl Seok Soon) meet each other. In anger, Lee Gyeom goes to Sujinbang and talks to Saimdang for the first time after 20 years. Ji-yoon gets a part-time job to make ends meet and continues to study Saimdang’s diary with Han Sang-hyun. Hye-jung finds a mysterious object hidden in Saimdang’s diary. Rebuked by Saimdang’s words, Lee Gyeom rediscovers his talent for painting. Ji-yoon and Hye-jung find a copy of John Donne’s poem “Valediction Forbidding Mourning” hidden in Saimdang’s diary. Ji-yoon’s husband sneaks into Sun Gallery and copies files from the Director’s laptop. Han Sang-hyun helps Ji-yoon and Hye-jung set up a new place where they can study the diary without being spied on by Prof. Min and his assistants. Lee Won-su, Saimdang’s husband, goes back home. Later, Saimdang tries to be a good neighbor with the deposed Queen. The King and his ministers visit Lee Gyeom to find out why his paintings have stirred up the people of Hanyang. In a fit of anger, Saimdang’s son Hyun-ryong storms out of the house, with little Woo following him. The King orders Lee Gyeom to establish Biikdang, Joseon’s center for the arts. While looking for her sons, Saimdang runs into Min Chi-hyung, the man who led the massacre at Unpyeongsa (Unpyeong Temple) 20 years ago. Saimdang warns Lee Gyeom about Min Chi-hyung. Saimdang’s son Hyun-ryong finds a copy of the King’s poem hidden in one of his grandfather’s books. Ji-yoon tells her husband that she can help him by proving that the “Mount Geumgang” painting is fake. Hwieumdang catches Hyun-ryong inside the premises of Jungbu School. Saimdang whips her children after they get involved in an incident at the market. Lee Gyeom continues investigating Min Chi-hyung. Ji-yoon’s husband tells her to file for divorce. Saimdang punishes her children for stealing dried persimmons at the market. Later, she takes them to the barren mountain and gives them hope for a better life. Despite their financial problems, Saimdang enrolls her son Hyun-ryong in Jungbu School. At the school, she, Lee Gyeom, and Hwieumdang meet each other again. When the mothers of Jungbu School protest Hyun-ryong’s admission, Lee Gyeom proposes a contest between Hyun-ryong and the other candidate for admission. Saimdang gets an idea on how she can earn some income for her family. Ji-yoon’s mother-in-law finds out about her situation and gets into a fight with her. Prof. Min gets a package from RADE. Hyun-ryong finally gets admitted into Jungbu School, and Saimdang tells Lee Gyeom not to meddle with her family. Saimdang finds plenty of mulberry trees in the barren mountain and decides to make paper as a source of income. Ji-yoon’s mother-in-law finds out about the divorce. Saimdang hires a former artisan at the Paper Production Office to teach her how to make paper. Saimdang gets a return gift from the deposed Queen. Hwieumdang proposes to Lee Gyeom a poetry and painting contest for the mothers and students of Jungbu School. The paper artisan steals Saimdang’s paper. Hwieumdang assigns “Unpyeong” as the topic for the poetry and painting contest in order to traumatize Saimdang. Saimdang runs away from the contest venue. Hwieumdang plans to bankrupt Saimdang’s paper business. Prof. Min forces his way into Ji-yoon’s bedroom. Ji-yoon’s conflict wth her mother-in-law increases. Saimdang and Lee Gyeom finally realize that Hwieumdang is the lowborn girl they knew as Seok Soon 20 years ago. Pressured by RADE’s investigation, Prof. Min threatens Ji-yoon. Ji-yoon finds the genuine “Mount Geumgang” painting hidden at the back of the portrait of the Joseon beauty. Saimdang goes back home but finds out that Hyun-ryong is missing. Hwieumdang orders her store manager to ask Saimdang to deliver 5,00 sheets of paper within five days. As Saimdang and her servant Hyang try to produce the paper, they meet a band of drifters. Lee Gyeom goes back to Unpyeongsa and talks to an old man who knows what happened 20 years ago. Prof. Min and his assistants enter the club searching for Ji-yoon and Han Sang-hyun. Later, Ji-yoon visits the director of Sun Gallery. Ji-yoon tells Director Sun that she has the genuine “Mount Geumgang” painting. Lee Gyeom finds out that someone survived the Unpyeongsa massacre. Saimdang offers the band of drifters a business deal to help her make the 5,000 sheets of paper. As Ji-yoon continues doing odd jobs, Prof. Min contacts her again. The drifters begin helping Saimdang make the 5,000 sheets of paper. Meanwhile, Hwieumdang’s store manager betrays her. The infighting and intrigues among the ministers continue, and Min Chi-hyung uses something from the past to intimidate the Prime Minister. When Hwieumdang’s new store manager refuses to buy the paper, Saimdang and the drifters begin selling them on the street. A fight then ensues between Lee Gyeom and Min Chi-hyung’s private soldiers. Saimdang begs on her knees for the drifters to understand why she couldn’t sell the 5,000 sheets of paper. As Saimdang prays in the mountain in memory of all the people who died in Unpyeongsa, an old man approaches her and asks for her forgiveness. Hanyang’s police arrest all of the drifters. Lee Gyeom goes back to Bukpyung Village to talk with Saimdang’s mother. The King visits Biikdang looking for Lee Gyeom. The old man tells Saimdang that the massacre wasn’t her fault and that Min Chi-hyung planned it so that no one else will know the secret to making Goryeo paper. Saimdang personally guarantees to the police officer that the drifters won’t run away and that they will pay their taxes. The old man tells Saimdang and the drifters how to make Goryeo paper. Lee Gyeom finally finds out from his great aunt what happened 20 years ago. He rushes back to Hanyang to see Saimdang. Unknown to them, Min Chi-hyung is watching them from afar. Lee Gyeom embraces Saimdang and asks for her forgiveness for all the sacrifices she made for him. Prof. Min’s assistants break into Ji-yoon’s apartment. Meanwhile, Ji-yoon’s husband finds a secluded van belonging to the Sunjin Group. Hwieumdang orders her servant to bring Man Deuk (Saimdang’s paper artisan) to her. The King’s bodyguard counsels Lee Gyeom on how he can protect Saimdang. Later, Lee Gyeom confronts Min Chi-hyung. The King’s bodyguard tells Lee Gyeom that, in order to protect Saimdang, he must not oppose the King. Lee Gyeom challenges Min Chi-hyung to a sword fight. Hwieumdang orders Man Deuk to spy into what Saimdang and the drifters are doing. Director Sun sets things up for Ji-yoon and Han Sang-hyun to transfer the genuine “Mount Geumgang” painting to the gallery. But Prof. Min and his goons hijack the painting. Han Sang-hyun and Hye-jung report the hijacking to the police, while Ji-yoon goes to see Director Sun. Hyun-ryong gets into a fight, and Saimdang is required to report to Jungbu School. As suggested by Lee Gyeom, the King and the ministers go on a hunting trip. When Lee Gyeom breaks away from the group, Min Chi-hyung follows him. Prof. Min burns the “Mount Geumgang” painting. Ji-yoon’s husband meets a car accident. Lee Gyeom is nearly hit by Min Chi-hyung’s poison-tipped arrow. 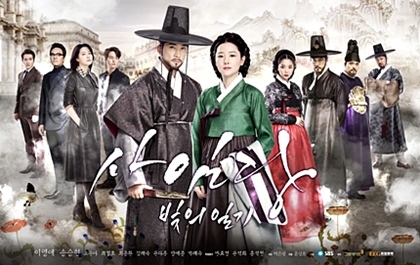 During her confrontation with the mothers of Jungbu School, Saimdang paints grapes and grape vines on the silk skirt; afterwards, she takes Hyun-ryong out of the school. The King and the ministers are thrown into chaos as the Ming ambassador arrives. The Ming ambassador is coming to Joseon because of the Emperor’s complaint about the quality of Goryeo paper sent as part of the tributes. 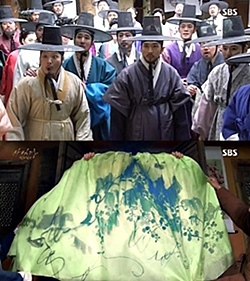 Saimdang’s painting on the silk skirt causes a stir among the people of Hanyang. At the temple, Lee Won-su is disciplined by the Head Monk. The Royal Court announces an open competition for those who can supply the government with the highest-quality Goryeo paper that the Ming Emperor demands. Ji-yoon’s son is traumatized by his father’s accident, and her mother-in-law becomes severely depressed. Saimdang decides to go back to Unpyeongsa (Unpyeong Temple) to find out the secret to making the highest-quality Goryeo paper. Through Lee Gyeom’s influence, Lee Won-su is appointed to a government office. Ji-yoon brings her son to her father’s house for rest and recuperation. Han Sang-hyun and Hye-jung find out that his friend Ah-na is related to Director Sun. After getting another message from RADE, Prof. Min calls up Ji-yoon. The King puts Lee Gyeom in charge of the Paper Production Office. Min Chi-hyung goes to a temple to visit Noble Lady Nam, a former Royal Concubine. Hwieumdang finds out that Saimdang is on her way to Unpyeongsa. Lee Gyeom orders the arrest of Min Chi-hyung for bribing the previous Ming ambassador. Hwieumdang and her men kill old man Pal Bong and corner Saimdang at a cliff. 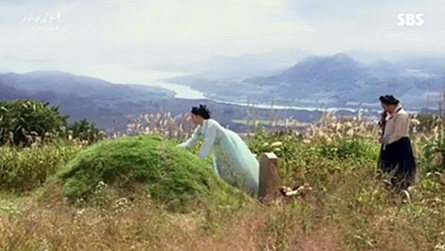 Lee Gyeom rescues Saimdang at a cliff. Together, they travel back to Hanyang. The Prime Minister and the other top ministers urge the King to execute Min Chi-hyung. With the looming deadline for submitting the Goryeo paper that the Ming Emperor demands, the King seeks the advice of Noble Lady Nam. The King releases Min Chi-hyung and orders him to produce the Goryeo paper that the Ming Emperor wants. Ambushed by Min Chi-hyung and his private soldiers, Saimdang and the wounded Lee Gyeom seek shelter in a cave. The King orders Lord So and the Royal Guards to rescue Lee Gyeom. The King ignores Lee Gyeom’s protests that Min Chi-hyung tried to kill him. Instead, the King tells him that whoever can produce the Goryeo paper that the Ming Emperor wants is his loyal subject. The race is on between Saimdang, on one hand, and Hwieumdang and Min Chi-hyung, on the other, to decode what the poem means on how to make the highest-quality Goryeo paper. Min Chi-hyung orders Man Deuk to sabotage Saimdang’s paper mill. Ji-yoon tries to cheer her son up; later, Hang Sang-hyun and Hye-jung come by for a visit. RADE reaches out to Ji-yoon. Saimdang finds out that pulp from mulberry and wisteria trees must be mixed in the right proportion to produce the highest-quality Goryeo paper. Despite the fire that gutted down her storage shed, Saimdang is able to join the paper selection competition. RADE gives Ji-yoon a postcard with the “Man in Korean Costume” painting by Rubens. For the final criterion in selecting the best paper, the Ming ambassador asks Saimdang and Hwieumdang to paint on their paper. Lee Gyeom urges the King to punish Min Chi-hyung. Ji-yoon studies the “Man in Korean Costume” painting by Rubens and its related painting “The Miracles of St. Francis Xavier”. Meanwhile, Han Sang-hyun tries to convince Prof. Min’s assistants to turn against him. Prof. Min shows to his assistants the genuine “Mount Geumgang” painting safely stored in his office. The King exiles Min Chi-hyung. Saimdang and the drifters have become prosperous paper merchants. Lee Gyeom fights off the Japanese raiders with a new weapon. Lee Won-su’s pregnant concubine goes to Yangyooo Paper Production Office. Lee Gyeom returns to Joseon after traveling all over Asia for the last two years. Min Chi-hyung pressures Hwieumdang to get him out of his exile. Ji-yoon tries to reconcile with her mother-in-law and to reach out to her son Eun-soo. When RADE continues to pressure him, Prof. Min orders his assistants to dig up any kind of dirt against Ji-yoon and Han Sang-hyun. Saimdang finds out that her husband Lee Won-su has taken in a concubine. Ji-yoon finds her mother-in-law unconscious and rushes her to the hospital. Ji-yoon finally breaks the emotional barrier between her and her son Eun-soo. The King tells the ministers that he wants to abdicate in favor of the Crown Prince. Lee Gyeom gathers the Biikdang staff for an important announcement. Later, his great aunt pressures him again to get married, and the Crown Prince visits him. Bandits attack the entourage of Princess Jeongsun (the King’s favorite daughter). Saimdang finds out that all of her paintings are missing from her studio. After staging a fake but deadly attack on Princess Jeongsun’s entourage, Hwieumdang and her men rescue her. Out of gratitude and remembering Noble Lady Nam’s advice, the King lifts Min Chi-hyung’s exile. Lee Won-su takes all of Saimdang’s paintings and gives them to his concubine, who sells them off. Lee Gyeom and the Crown Prince, in disguise, visit the market and Yangyoo Paper Production Office. Lee Gyeom buys back all of the paintings and restores them to their proper places in Saimdang’s studio. Princess Jeongsun visits Saimdang at her studio. Min Chi-hyung tries to regain the political power that he once had. Saimdang visits Lee Won-su’s concubine. The Crown Prince appoints Lee Gyeom as the head of the Bureau of Paintings. Han Sang-hyun and Hye-jung ask the help of the president of the Antique Arts Society. Prof. Min retaliates against Ji-yoon, Han Sang-hyun, and Hye-jung. Ji-yoon and Han Sang-hyun are accused of plagiarizing their theses, and Hye-jung gets fired from her job at the National Museum. Disguised as a boy, Mae-chang wins the first round in the selection of new artists for the Bureau of Paintings. Min Chi- hyung agrees to sell the blueprints of Joseon’s turtle ship to the Japanese. Mae-chang gets kicked out of the Bureau of Paintings competition for new artists. Min Chi-hyung meets Saimdang and Mae-Chang at night in the market. Lee Gyeom announces an open competition for the Royal Portrait Painter. Ji-yoon decides to go back to Seoul and fight back against Prof. Min. Later, she gets an email from RADE asking her for a face-to-face meeting. Saimdang wins the open competition for the Royal Portrait Painter. But the ministers and the Confucian scholars begin protesting her appointment. At the portrait-painting session, the King tells Saimdang that he remembers her and her father. Prof. Min bribes the president of the Antique Arts Society to discredit Saimdang’s diary. Ji-yoon finds out more about RADE from its Korean representative. While Saimdang begins working on the Royal Portrait, Hwieumdang plans how to steal the blueprints for Joseon’s turtle ship. The ministers continue protesting against Saimdang’s appointment. The King visits the capital in disguise. Later, he orders Lee Gyeom to paint the Royal Portrait together with Saimdang. Hwieumdang steals the blueprints for Joseon’s turtle ship. With the help of the Confucian scholars, the King plans to discredit Saimdang and Lee Gyeom during the public unveiling of the Royal Portrait. But his plan backfires when people praise the Royal Portrait in music and dance. Saimdang reaches out in friendship to Hwieumdang. The King orders Min Chi-hyung to kill Saimdang and Lee Gyeom. Lee Gyeom races to where Saimdang is being held, but there, he’s surrounded by Min Chi-hyung and the Japanese. The King orders Lee Gyeom’s arrest for treason. Lee Won-su brings his concubine to the family home in Sujinbang. One of Prof. Min’s assistants turns against him. After Ji-yoon gets the genuine “Mount Geumgang” painting back, she and the Korean guy from RADE plan how to entrap Prof. Min. Hwieumdang entrusts her children to Saimdang. 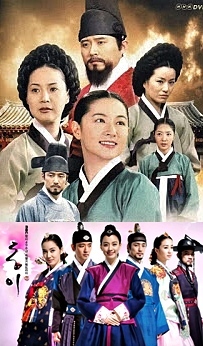 After Saimdang finds Lee Won-su and his concubine in the family home, her children urge her to fulfill her lifelong dream of climbing Mount Geumgang. Lee Gyeom follows Saimdang, and at last, they fulfill their teenage dreams of painting at the mountain together. The King finds out that Saimdang has returned to Hanyang; he immediately orders her placed under house arrest in order to catch Lee Gyeom. After Ji-yoon copies the John Donne poem from the diary, she begins acting strangely, telling Han Sang-hyun and Hye-jung that the “Portrait of a Joseon Beauty” is fading. Goons sent by Prof. Min attack the club, searching for the “Mount Geumgang” painting. Ji-yoon grabs the painting and rushes out of the room, but the goons corner her at the club’s rooftop. Saimdang leaves Lee Gyeom, choosing to return to her children. She also burns An Gyeon’s “Mount Geumgang” painting and her own painting. Lee Gyeom decides to protect Saimdang by giving himself up to the authorities. The King then orders his exile and death by poisoning. Ji-yoon falls from the rooftop and is rushed to the hospital. In her vision, she meets Saimdang. Ji-yoon assures Saimdang that she can save Lee Gyeom. Saimdang rallies the bandits and the drifters to rescue Lee Gyeom. She also seeks the help of Lord So and the Crown Prince. A mysterious man visits Ji-yoon at the hospital. Later, Director Sun also visits Ji-yoon. Ji-yoon’s husband turns up alive and is reunited with his family. With help from the Crown Prince’s men, the bandits and the drifters catch up with the soldiers escorting Lee Gyeom to his exile. But to everyone’s surprise, the King’s bodyguard releases Lee Gyeom. Later, the bodyguard kills himself. At the river, Saimdang and Lee Gyeom bid each other farewell. After an arduous journey over land and sea, Lee Gyeom reaches Italy. 1. I assumed that you will be reading these recaps and watching the videos chronologically. 2. I narrated the main actions in each episode without revealing the plot’s twists and turns. 3. At the beginning of each synopsis starting with Episode 2, I placed in a table some of the major twists and turns of the previous episode. But because you have already watched the video of the previous episode, they aren’t spoilers anymore. (a) The SBS version focuses on the historical timeline, while the international version has an equal balance between the historical and modern timelines. The SBS version doesn’t show us why Lee Won-su brazenly brought his concubine to Saimdang’s house. But the international version shows us in two episodes that Lee Won-su has found out about Saimdang and Lee Gyeom’s affection for each other. These two episodes are (1) when Lee Gyeom holds Saimdang’s hand after they watched Min Chi-hyung being sent into exile, and (2) when Lee Won-su brings food to Saimdang after she was appointed as Royal Portrait Painter, and he sees Saimdang and Lee Gyeom having dinner together. In Ep. 27 SBS version, Ji-yoon gives to Saimdang the bracelet that her son Eun-soo gave her. Ep. 26 SBS version does not tell us the bracelet’s significance, but the international version does (in the dialogue between Ji-yoon's father and her son Eun-soo as they’re buying the bracelet). In Ep. 23 SBS version, Hwieumdang shoots an arrow with a message attached to it. Lee Gyeom reads it and then goes to Saimdang’s rescue, with Hu rushing to the Crown Prince who then sends his royal guards to help Lee Gyeom. It appears from the SBS version that the Crown Prince only wanted to help Lee Gyeom rescue Saimdang. But the international version shows that Hwieumdang warned Lee Gyeom that Min Chi-hyung was selling the blueprints for Joseon’s turtle ship to the Japanese raiders and that the Crown Prince sent his men to help Lee Gyeom rescue Saimdang and to prevent the Japanese raiders from getting the blueprints. (c) The sequence of events are different in the two versions. For example, the episode where Saimdang confronts Hwieumdang and the other mothers and paints on the silk skirt is Ep. 13 SBS version. But these scenes are in Ep. 16 or 18 (if I remember correctly) in the international version. Note: These exercises were created using Hot Potatoes v. 6.3, a freeware from the University of Victoria, British Columbia, Canada. StyleWriter 4 checks 10,000 words in 12 seconds for hundreds of style and English usage issues like wordy and complex sentences, passive voice, nominalization, jargon, clichés, readability, spelling, etc. Watch the video demo of StyleWriter 4 features. Download your free 14-day trial copy now. StyleWriter 4 is widely used in the US federal government (for example, the Environmental Protection Agency). It can be used by educators, students, and professionals in various fields — business, law, social or physical science, medicine, nursing, engineering, public relations, human resources, journalism, accounting, etc. It comes with three versions: USA, UK, and Australian. Documents that StyleWriter 4 can edit are articles, press releases, resumés, cover letters, technical manuals, speeches, sales letters, proposals, books (fiction or non-fiction), legal documents, advertising copy, memos, business plans, essays, research papers, policies, blog posts, procedures, thesis, dissertations, and corporate communications. StyleWriter 4 provides 50 times more editing advice than MS Word's proofreading tools. Learn more about StyleWriter 4. You can also download PDF guide to StyleWriter 4 and testimonials from the Halifax Bank of Scotland, London-based law firm Denton Wilde & Sapte, and County of Los Angeles, USA. What is the impact of simplicity on businesses, on customer, and on employees? On businesses: Higher customer loyalty (75% will tell other people about the brand). ESL Kids Lab for English teaching and learning. ESL Printables, a website where English language teachers exchange resources like worksheets, lesson plans, activities, etc. StyleWriter 4 checks 10,000 words in 12 seconds for hundreds of style and English usage issues like wordy and complex sentences, passive voice, nominalization, jargon, clichés, readability, spelling, etc. StyleWriter 4 graphs your style and sentence variety, and identifies your writing habits to give an instant view of your writing. You can learn, for example, the writing style of Newsweek, Time, The Economist, and Scientific American. StyleWriter 4 can be used by educators, students, and professionals in various fields — business, law, social or physical science, medicine, nursing, engineering, public relations, human resources, journalism, accounting, etc. It comes with three versions: USA, UK, and Australian. Download your free 14-day trial copy now. Other public speaking tips on preparation, humor, voice, etc. Definition: Something of small importance.